A source with remarkable similarities to GW170817, the first source identified to emit gravitational waves and light, has been discovered. This new object, called GRB 150101B, was first seen as a gamma-ray burst in January 2015. Follow-up observations with Chandra and several other telescopes at different wavelengths uncovered common traits between the two objects. 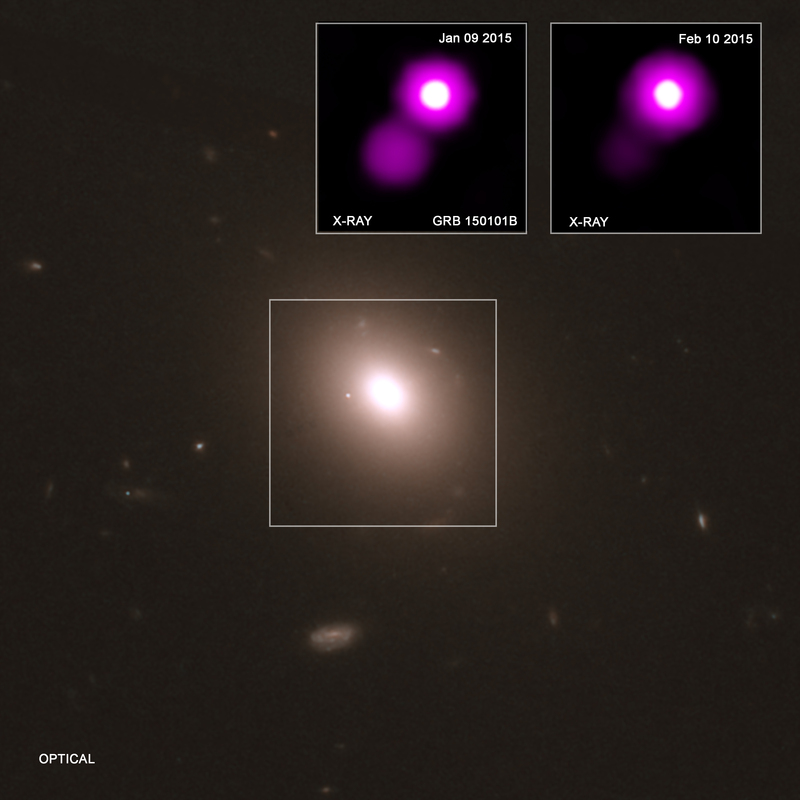 Chandra images showed how GRB 150101B faded with time, a key piece of information. A distant cosmic relative to the first source that astronomers detected in both gravitational waves and light may have been discovered, as reported in our latest press release. This object, called GRB 150101B, was first detected by identified as a gamma ray burst (GRB) by NASA's Fermi Gamma-ray Space Telescope in January 2015. This image shows data from NASA’s Chandra X-ray Observatory (purple in the inset boxes) in context with an optical image of GRB 150101B from the Hubble Space Telescope. The detection and follow-up observations with Chandra, Hubble, the Discovery Channel Telescope, the Neil Gehrels Swift Observatory, and other telescopes show GRB 150101B shares remarkable similarities to the neutron star merger and gravitational wave source discovered by Advanced Laser Interferometer Gravitational Wave Observatory (LIGO) and its European counterpart Virgo in 2017 known as GW170817. In this view of GRB 150101B and its host galaxy, the Chandra field of view is outlined as a box on an optical and infrared image from the Hubble Space Telescope. 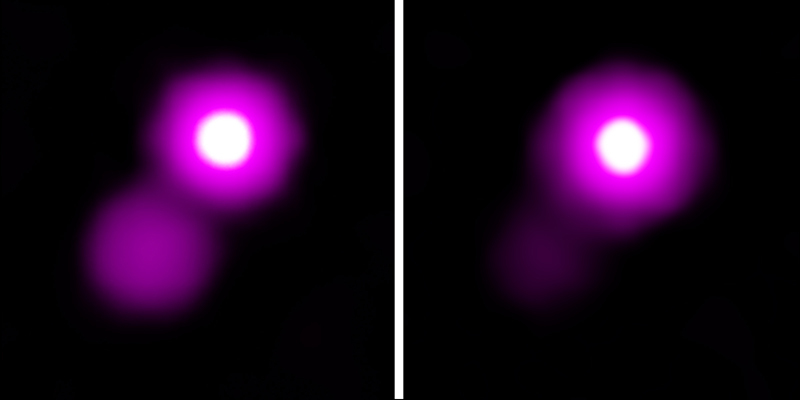 Chandra images are included from two different times (labeled in the insets) to show how the X-ray source faded with time. The latest study concludes that these two separate objects may, in fact, be related. The discovery suggests that events like GW170817 and GRB 150101B could represent a whole new class of erupting objects that turn on and off in X-rays and might actually be relatively common. 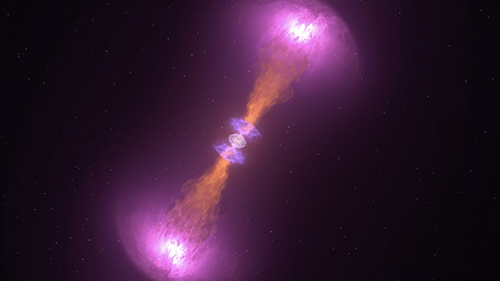 The researchers think both GRB 150101B and GW170817 were most likely produced by the same type of event: the merger of two neutron stars, a catastrophic coalescence that generated a narrow jet, or beam, of high-energy particles. The jet produced a short, intense burst of gamma rays (known as a short GRB), a high-energy flash that can last only seconds. GW170817 proved that these events may also create ripples in space-time itself called gravitational waves. While there are many commonalities between GRB 150101B and GW170817, there are two very important differences. One is their location. GW170817 is about 130 million light years from Earth, while GRB 150101B lies about 1.7 billion light years away. Even if Advanced LIGO had been operating in early 2015, it would very likely not have detected gravitational waves from GRB 150101B because of its greater distance. It is possible that a few mergers like the ones seen in GW170817 and GRB 150101B had been detected as short GRBs before but had not been identified with other telescopes. Without detections at longer wavelengths like X-rays or optical light, GRB positions are not accurate enough to determine what galaxy they are located in. In the case of GRB 150101B, astronomers thought at first that the counterpart was an X-ray source detected by Swift in the center of the galaxy, likely from material falling into a supermassive black hole. However, follow-up observations with Chandra, with its sharp X-ray resolution, detected the true counterpart away from the center of the host galaxy. This can be seen in the Chandra images. Not only has the source dimmed dramatically, it is clearly outside the center of the galaxy, which appears as the constant brighter source to the upper right. A paper describing this result by Eleonora Troja (Goddard Space Flight Center and the University of Maryland at College Park) and colleagues appears in the October 16, 2018, issue of the journal Nature Communications and is available online. NASA's Marshall Space Flight Center in Huntsville, Alabama, manages the Chandra program for NASA's Science Mission Directorate in Washington. The Smithsonian Astrophysical Observatory in Cambridge, Massachusetts, controls Chandra's science and flight operations. Coordinates (J2000) RA 12h 32m 04.96s | Dec -10° 56' 00.7"
A likely merger of two neutron stars located about 1.7 billion light years from Earth. About 1.7 billion light years from Earth. X-ray light from Chandra and optical and infrared light from Hubble Space Telescope. About 300,000 light years across. X-rays are purple; Optical/IR red and green.